Many people have no idea that they can retire in their 50s. So they keep on working. Making sure income covers expenses in retirement is the key. Solid dividend growth stocks can generate the income needed to retire early. There are thousands of people each year who continue to work into their 60s when they wish they could simply retire or reduce their workload. But because they don't know what they actually need to retire, they keep right on working. But with today's online planning tools, nearly anybody can figure out when they can retire comfortably and what they need to do to get to that spot. Let's look at an example of a couple that is thinking about retiring when they're 58 years old. They think they need to keep working until age 65, but do they really? I ran this couple's retirement plan in the WealthTrace Financial Planner and found that they would have about $600,000 when they retire at age 58. I also found that they will not run out of money in retirement. But, this is just in the static base case where rates of return never change. This is not realistic. This is why we need to also run Monte Carlo analysis on their retirement plan. 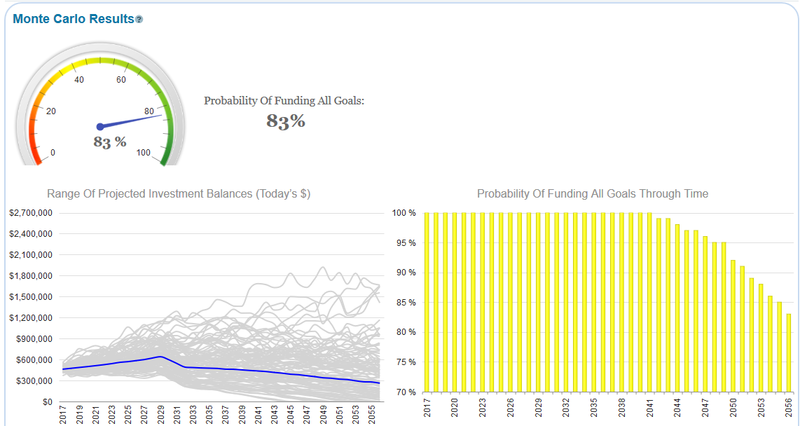 I ran this analysis and found that their probability of never running out of money is only 60%. In Monte Carlo we run thousands of scenarios, similar to a weather forecast, and see how many times the plan is successful. By successful we mean that they do not run out of money. 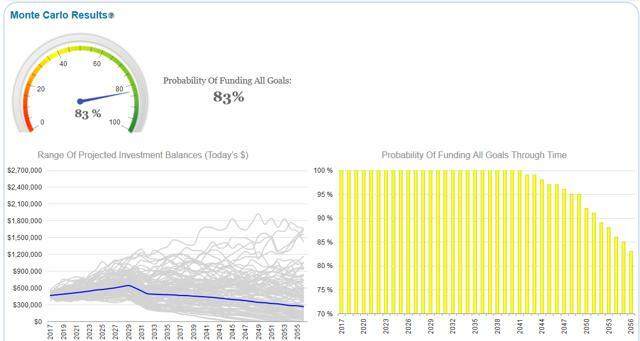 We would like to see this Monte Carlo number above 80%. How do we get there? One way is for this couple to save $3,000 more per year. But they're already saving what they can, so that won't work. Another way for them to raise their probability of success above 80% is to cut their expenses in retirement by $5,000. But they have no more room for spending cuts, so this idea won't work for them either. 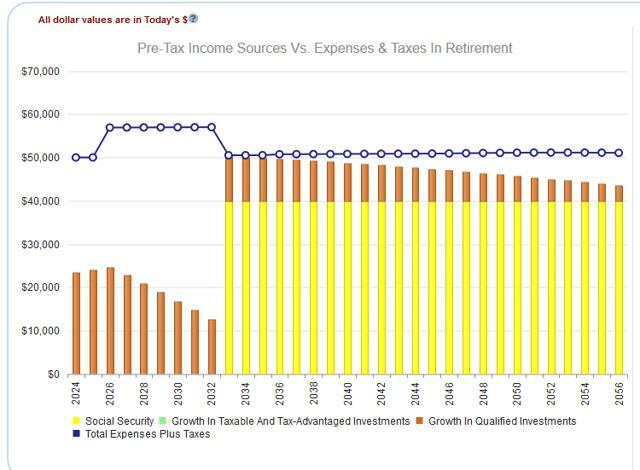 Before they begin receiving social security, there is a large gap between income and expenses. This gap will be there no matter what we do for them. But the real problem is the gap between income and expenses once they turn 67. 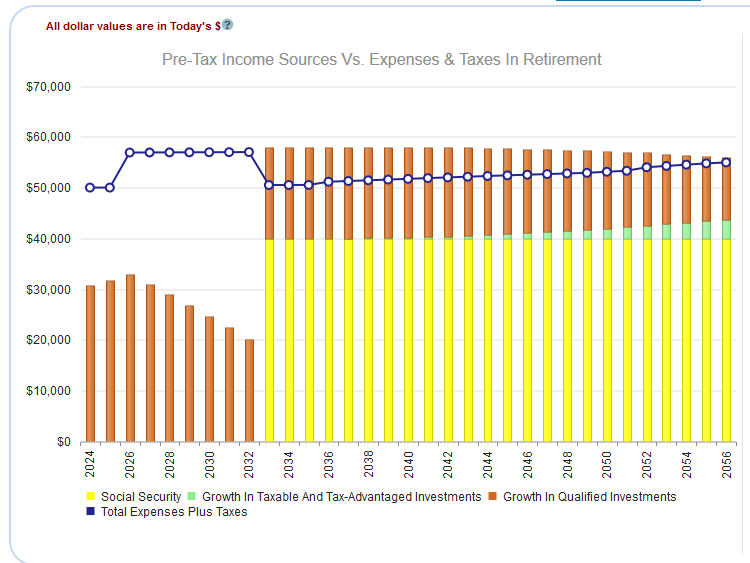 They never have enough to meet their expenses, so they are constantly dipping into their investment balances. So how can we generate more income? My answer is to place the bond portion of their portfolio and half of their stock holdings into solid dividend growth stocks. I'm looking for companies that pay a dividend of at least 2.4% and a long history of solid dividend growth. Some of my favorites are: Altria (MO), Wal-Mart (WMT), Johnson & Johnson (JNJ), and Procter & Gamble (PG). They are now covering expenses once social security kicks in. This in turn boosts their probability of plan success to 83%. Many people immediately tell me that moving their bonds into dividend paying stocks is riskier, and they are indeed right about this. But the question is, how much reward do you get for taking a bit more risk? Thankfully Monte Carlo analysis teases this out for us and we can see that their plan is much better off with their new allocation. It is also important to keep in mind that dividend payers with steady dividend growth are less volatile than the average stock. Moving completely out of bonds does not make sense for everybody. But for some, it can change when they can retire. The key is to find very solid dividend payers and to live off of the income so that price swings don't impact the overall plan. Disclosure: I am/we are long WMT, JNJ, MO. I wrote this article myself, and it expresses my own opinions. I am not receiving compensation for it (other than from Seeking Alpha). I have no business relationship with any company whose stock is mentioned in this article.